The Springfield Bicycle and Pedestrian Advisory Committee will meet from 6-7:30 p.m., Tuesday, April 9 at Springfield City Hall (225 Fifth Street) in the Council Chambers. The community is welcome to attend. The Springfield Bicycle and Pedestrian Advisory Committee was established in 2011 and is a volunteer body that advises the Springfield City Council and City staff on bicycle and pedestrian matters in the city. The Committee consists of 10 – 16 voting members who meet on the second Tuesday of every other month, or as needed. Committee recruitment typically occurs in autumn each year. 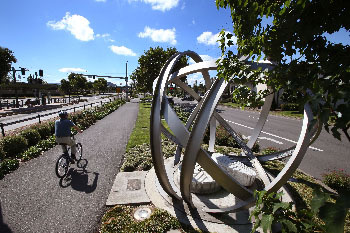 Meeting information is posted to the committee webpage at http://www.springfield-or.gov/city/development-public-works/bicycle-and-pedestrian-advisory-committee/.